Over the years LUCID Optics has had several requests for a First Focal plane, Mil / Mil rifle scope. While we were growing into the rifle scope space from the red dot market,we always found fascination with the first focal plane optical engineering in rifle scopes. So when it came time to bring an optic like this into our mix, we went to the matches and sat at the bench with competitive PRS shooters and professional bad guy hunters alike. It was in these discussions that we learned exactly what the needs of a First Focal plane optic operator may want. True to LUCID Optics ideal we balanced the �Must Have�, list of features and benefits with the �Want to Have�, list of specifications and areproud to introduce the NEW MLX Rifle scope. This precision optic was built from the ground up, offering a crystal clear 4.5-18x magnification range , built on a proven and easy to mount, 30mm, one piece, 6063 aluminum tube construction with nearly 6� of mounting length. The optical system is set on the Front Focal plane, keeping the MLX reticle measurement aspects precisely consistant through the entire range of magnification. The NEW MLX reticle is a highly useful Mil based reticle with over 10MIL�s of measurement in �hold over� and 5 Mil�s of hold under available on the higest magnification in the field of view. The windage and elevation turrets are metered in a precise 1/10Mil tactile and audible click adjustment increments featuring a very useful �Lift, Adjust Press down to lock, Lift Higher to re-zero�, mechanisms designed for secure and precise adjustments available to meet the needs of the shot. The glass selection and lens coatings have been specifically designed to offer an exceptional high resolution image through the carefully balanced optical engineering with a 44mm objective lens providing the light gathering performance second to few. As always here at LUCID Optics we took all of the above in product �Wants, Needs and desires,� in quality, balanced by affordability, then packed into a unique optic with a LUCID optics Lifetime Warranty. We are additionally proud of being able to offer this optic at a price that is shockingly low. The way we see it, no need to compromise on qualityand the benefit of simply having more money for ammo is all yours. This reticle is set in the MLX 4.5-18x44 in the first focal plane. This means that the reticle grows and shrinks in appearance with the magnification change, keeping the measurements of the reticle consistent. 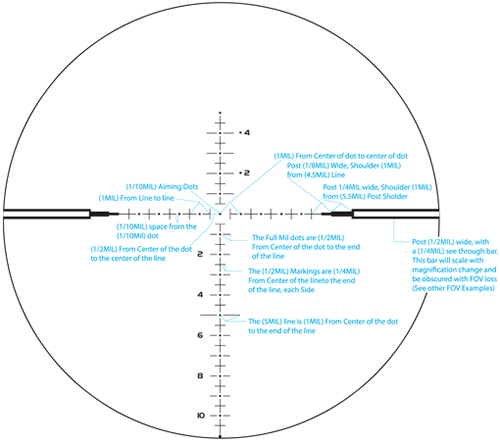 Understanding MIL’s - In the MLX reticle, the space between the dot centers subtends a 1/2 Mil to Full MIL increments. Reference - One Mil subtends roughly 3.6” at 100yds, or 36” at 1,000 yards. With this information,the operator should be able to estimate range to the target in the reticle if they know how big the target is. Most of the time these calculations are done with a calculator or with a pre-made reference chart. But remember that the answer is only as accurate as the numbers used in the formula. An error of just a 1/4 mil will cause an error in target range possibly causing a miss. Also an error in estimating the size of your target properly will cause an error in target range. Ok, back to the Example - A 6-foot-tall man (2 yards). The top of his head lines up with one line and his feet line up (4) MILS down. So: (2/4)*1000 = 500, know what your bullet does in drop and hold for 500yds knowing this is an estimate. With the NEW MLX reticle offering 10MIL’s of “hold over” and 5 Mil’s of “hold under” available on the higest magnification, more as you reduce the magnification and increase the FOV. The PRS competitor and MIL oriented precision shooter will be right at home behind this reticle.